I have a cousin named Betty who I've never met, but I'm helping her grow tomatoes. The story I was told about my closest uncle was: he was married three times and each time he started over by having a baby girl and naming her Rachel after his mother. There are some tricksters among my family. Turns out he was married twice and did not name any of the children by duplicate names. My cousin's name is Betty. She lives two states away from me and I haven't met her yet. 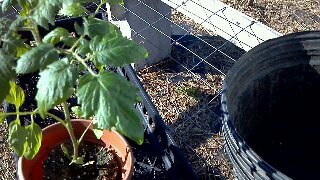 But we have met virtually and she is growing tomatoes in pots. She's got a cousin in the business - that's me. (wink wink) Alas I do know how to grow tomato plants! She's not to be confused with the Betty who lived next door to the first greenhouse and had a tomato plant growing contest every year with her husband. I tried to give her advice too, but she never took it and he did until he was really unbeatable. Nor is she the Garden Betty. Plant it deep and use lots of soil amendments, even grass clippings and especially dried leaves. If it's already planted, top it off with a thick layer of compost. Sprinkle some pelleted or slow release fertilizer, wood ashes and boiled, ground up eggshells on it. Then cover the soil with 5 layers of newspaper. Dump grass clippings on top of that. Now's the time to feed and water! Compost tea or other liquid fertilizer once a week. If it doesn't rain at least a little twice a week, water it. Tomatoes need to stretch slowly. If the tomatoes get one big watering like they would in a rainstorm, they will split. You should stake them, but this is not totally necessary. Staking takes time. I believe nature designs plants in the way that it is best for them to grow. I never pinch the side shoots and rarely stake them. However, I also think the tomatoes rotting on the ground is nature's way of propagating them and I have usually given up on the gardening by the second month of 100 degree heat. Just a few tomato plants grown well will yield as many tomatoes as a whole row of untended plants. You really only need to work a little at gardening to get food. If you are spending all your time gardening, planting, planning and shopping for your garden, become a farmer! The world desperately needs more farmers!....but that is for another post.